The following programs or projects are supported in full or in part by donations made to the Foundation of Monroe County Community Schools. Descriptions provided below. Since awarding its first grant in 1976, the Foundation of Monroe County Community Schools has awarded 1,763 grants to MCCSC teachers, administrators and students for educational projects to improve and enhance the educational development of students. For more information please see our Grant tab. The Real Men Read program is an early childhood literacy program to help our youngest students build a strong foundation in reading. 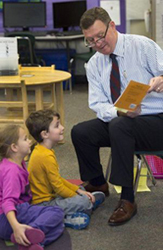 The program places a MENtor with each kindergarten classroom in the district. The MENtors visit their classroom once a month for 5 months during the school calendar and read to the students. The MENtors read an assigned book and help students with vocabulary, fluency and reading comprehension of the book. Each student is given a copy of the book to take home and read with their family. MENtors are from all walks of life in our community and help model to our children the importance of literacy in our lives. More information is available on our Real Men Read Parent/MENtor Portal page. The Real Men Read program is sponsored by the 50+ Men Who Care of Bloomington and Monroe County and German American Bank for the 2017-2018 school year. 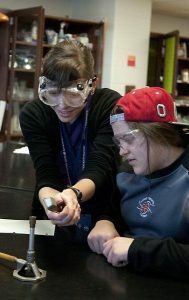 The FMCCS Science Initiative is a multi-phased effort to improve and enhance science education in MCCSC. Generous donations from local businesses and organizations have allowed the Foundation to fund an MCCSC science content coordinator, to underwrite a Science Resource Center, and to purchase equipment for a science equipment loan program. The MCCSC science content coordinator is responsible for aligning and articulating curriculum system-wide, for supporting teachers in the instruction of science, and for working with institutions of higher education and local employers to develop a stronger curricular tie between classroom content and career preparation. The MCCSC Science Resource Center was opened to support classroom science instruction and a science equipment loan program was begun to offer teachers access to sophisticated equipment that would not otherwise be available for use in classrooms. The Foundation of Monroe County Community Schools and the MCCSC launched a new initiative in April 2017. 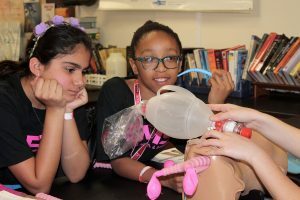 The GEMS program is designed to build a community network for female role models working in STEM industries and careers to help young girls see STEM in a fun and engaging way. The goal is to engage young girls in STEM at younger ages and learn more about career opportunities. 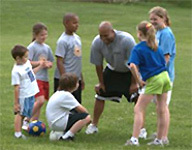 The Foundation of Monroe County Community Schools recognizes the importance that the health and physical well-being of students and staff plays in K-12 education. Research has shown that healthier students are better able to learn than those that are less healthy. Diseases such as childhood obesity and related conditions can directly impact the ability of our students to learn on a daily basis. In recognition of this risk, the FMCCS is proud to provide resources to our schools that enhance the health, fitness, and overall wellness of our children. Grants related to Health and Wellness can be written through the Grants to Equip, Inspire, & Innovate program. The Foundation of Monroe County Community Schools manages and administers 29 scholarships and awards to support a variety of educational opportunities for high school students. Recipients are chosen by teachers, administrators or counselors at area high schools. For information on establishing a scholarship or award, please contact the Foundation at 330-7700. To apply for a Foundation scholarship, please visit your high school guidance office. A detailed list of Foundation scholarships and awards can be accessed by clicking on the link above. The names of recent recipients are also provided. Each year, the Foundation hosts the Personal Achievement banquet to honor a group of exceptional students. Each of the award winners has chosen to persevere in the face of adversity in their life in order to continue pursuing an education. These young people are selected for this honor by their teachers, who nominate them and make the awards presentation. The IUCU Credit Union sponsors four scholarships awarded at the banquet. The Foundation maintains a number of professionally managed endowment funds established by individuals and organizations in the community for the purpose of sustaining long term funding for various programs to benefit students. For more information on establishing an endowed fund, contact the Foundation at 330-7700. Donations to previously established endowed funds are accepted at any time. For a list of current endowed funds, please visit our Endowments Page.